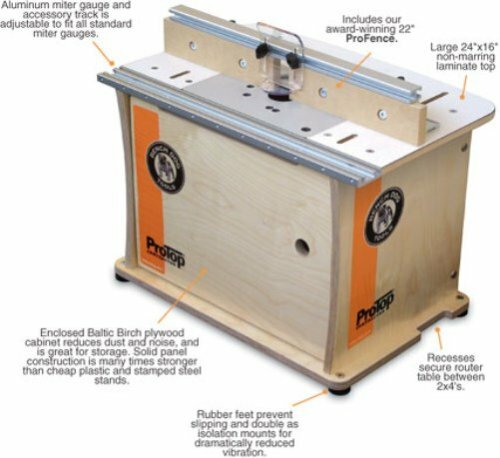 A router table is a great asset in any workshop and the Bench Dog 40-001 is an ideal router table for both professional craftsmen. This machine will make it easy to handle complicated wood cutting tasks in a precise manner. The high quality fence enhances the precision and accuracy provided by this router table. It is made from premium aluminum and is machine-cut so as to ensure that it is completely flat. The fact that it is very easy to operate would make it an ideal machine for people who are serious in DIY woodwork projects. The miter accessory can be adjusted so as to accommodate standard miter gauges. Who Is Bench Dog 40-001 Ideal For ? This router table has compact dimensions of 26.8 x 22.8 x 5.1 inches, which makes it occupy very little space. It weighs 43.2 pounds and thus you can move around with it from one workstation to another. There are rubber feet on the legs of this router table which will protect the machine as well as your floor surface. It has an aluminum miter accessory track that can be adjusted easily to fit any standard miter gauge. The router table has clear acrylic inserts, which will accept most routers without a problem. The cabinet it made from melamine, which gives it durability. The laminated top of the table is large enough since it measures 16 x 22 inches. The extruded aluminum fence is large enough and has T-slots, which enhance the versatility of the router table. The MDF face plates are easy to adjust so as to achieve zero clearance. The table has dual fence slots, which will make it easier to handler larger panels and save on your space. This router table is quite versatile and can be an ideal tool for professional woodworkers as well as dedicated carpenters. Beginners in wood work projects will also find the router table to be quite suitable for them. Accuracy and precision are the main advantages for the users. The Bench Dog 40-001 is known to be versatile since it works with almost every type of router. Bench Dog is a reputable manufacturer and this is somewhat an assurance of quality. 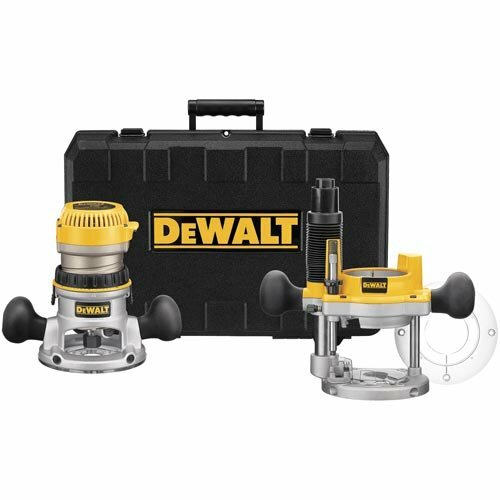 One of the models that this router table works effectively with is the DEWALT DW618PK router. The router has ½ and ¼ inch collets, which make it possible to have fine cuts for your woodwork projects. Most of the consumers who have used the Bench Dog 40-001 ProTop Contractor Benchtop Router Table are impressed by the combination of class and quality. It has been given a very high rating on different platforms as a result of its quality and ability to handle versatile tasks. The router table has a large surface area, which is laminated with plastic. The top surface is non-marring and this makes it an ideal router table for professional craftsmen. The melamine cabinet is durable and the rubber feet protect the router table and provides sturdy support by reducing the vibration. There is a 2-year limited warranty provided by the manufacturer. The aluminum miter accessory track will support the standard miter gauges since it is easy to adjust. Fix the metal legs to the cabinet and ensure that you attach the rubber feet. Assemble the aluminum fence and attach the MDF face plates to the router table. Put the router plate in place and check to see if it has predrilled holes. Place your router on the table and align it to the metal plate so as to start your routing tasks. The main maintenance task required on this router table is to ensure that the dust collection port is always clean. Lubricate the movable parts and always ensure that are accessories are stored in their respective compartments. This is made possible by the mere fact that it can fit in most of the common router models in the market. This is an ideal investment for all those who love woodwork, from beginners to professionals. If you don’t like this model, may be the Bench Dog Promax will be another choice to suit your woodworking work .